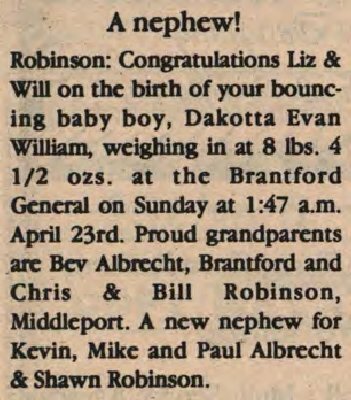 Congratulations Liz & Will on the birth of your bouncing baby boy, Dakotta Evan William, weighing in at 8 lbs. 4 1/2 ozs. at the Brantford General on Sunday at 1:47 a.m. April 23rd. Proud grandparents are Bev Albrecht, Brantford and Chris & Bill Robinson, Middleport. A new nephew for Kevin, Mike and Paul Albrecht & Shawn Robinson.